When your woodworking project calls for decorative trim and lettering, Whiteside bits have the solution. 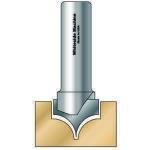 Point Cutting Round Over router bits have a plunging point and rounding profile that make this router bit ideal for those jobs. These Point Cutting Round Over router bits are manufactured by the award-winning Whiteside Machine Company. Scan the list below and if you don’t see the tool you need for specialized woodworking, contact us and we’ll do our best to locate it for you. 1/4" 1/8" 1/4" 2" 1/4"
3/8" 3/16" 3/8" 2" 1/4"
1/2" 1/4" 1/2" 2" 1/4"
3/4" 3/8" 5/8" 2" 1/4"
3/4" 3/8" 5/8" 2-1/4" 1/2"
1" 1/2" 1" 2-3/8" 1/2"